2. Open up Audacity, then go to File > Open > Select the downloaded audio from the location you saved it on your computer. 3. You should see a small waveform, play it and just listen to the distortion in my voice. 5. Next click with the left mouse button and drag it over a small section of the waveform. 6. 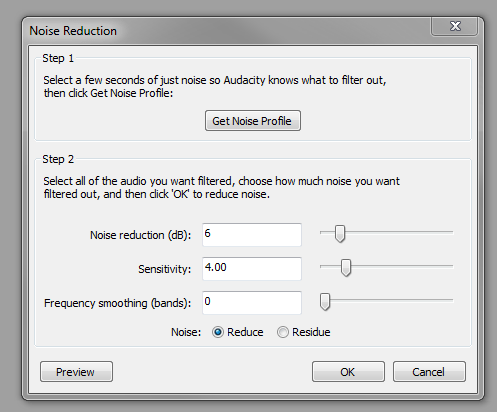 With the selected section, go to Effect > Noise Reduction. This will open the Noise Reduction pane and you then need to click on ‘Get Noise Profile’. 7. It may appear that nothing happens, but that’s okay. Now this time, go to Edit > Select all. 8. Go to Effect > Noise Reduction > At this point you’ll need to be wearing headphones so that you can listen to the audio previews. Leave the standard settings in step 2 and click on Preview. At this point you may think that it still doesn’t sound too good. You’d be right! The advice I can give is to play with the settings in step 2 and keep previewing your audio file. It took me about three minutes to get the preview to sound acceptable and my settings can be seen below. You may well be able to further improve this track by tweaking the settings and previewing the sound.